Today was the fifth annual Can/Am Veterans Cup for fencing. It's the biggest Veterans only tournament in North America. 137 fencers turned out at the Vango Fencing Centre showed up ready to fence. many fenced more than one weapon as there were a total of 198 entries for all three weapons. Vango is a first class fencing facility. I originally was going to fence in the Men's Epee and Men's sabre but when I tore a calf muscle a few months ago, decided not to push it and fenced sabre only. Despite coming off an injury and with little practice, I managed to go 3-3 in the pools. I won two matches 5-4, one being a 4-2 comeback and the other a 4-3 comeback, but also lost one 5-4 where my opponent made a comeback on me. In my first elimination match, I was down 9-7 but amazingly for me, scored three defensive points to take the match 10-9. if you look at the final standings you will see Mikhail Mironovas won the gold. Well, my next elimination was against him and he cleaned my clock 10-2 on the way to his Gold. 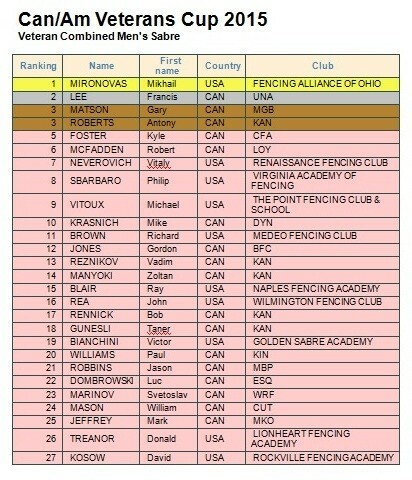 I ended up in 12th place out of 27 fencers and am happy with that finish. This was the last tournament for this season. I am so looking forward to heading into next season healthy! Interesting way to get a hit. Now this one, although off target, looks like it would hurt.